This article was originally published in the online journal ‘Sword of Truth’. Further information on the subject can be found in the author’s book, of the same title. Dr. N. S. Rajaram is an author and mathematician, based in the USA, where he formerly worked for the National Aeronautic and Space Administration (NASA), in the fields of Artificial Intelligence and Robotics. In recent years he has written extensively in the fields of archaeology and ancient history. As we go on to celebrate another Sri Krishna-Janmashthami, here is a question of interest to all of us: was Krishna a historical figure, or is he just a myth created to fill a void in the Hindu soul? As the most admired and adored figure in the Hindu pantheon, Krishna occupies a unique place in Indian history and tradition. Known since time immemorial as a Yadava prince of the house of Vrishni, and the son of Vasudeva and Devaki, most Hindus have accepted Krishna an avatar or incarnation of Lord Vishnu. But now, in keeping with the spirit of the scientific age in which we live, many people – including Hindus – want to know if he really existed. This is not a new phenomenon: the question of his historicity has engaged the attention of scholars for nearly two centuries, ever since European scholars began to study India, questioning every belief that the Hindus had held for millennia. They concluded – and their Indian followers faithfully accepted – that Krishna was a myth. In reality, it was a preconceived answer, which they sought to justify by giving it an appearance of scholarship. But in these articles I will present evidence to show that Krishna was indeed a historical figure who lived about 5000 years ago. Since the life and career of Krishna lie within the century or so described in the great historical epic Mahabharata, if we can demonstrate the historicity of the characters and the principal episodes of the epic, we will essentially have established Krishna’s historicity also. And the same goes for the date: once we know the dates of the principal events in the Mahabharata, like the War, we automatically have an approximate date for Krishna. If, on the basis of our search, we can ascertain the existence of Krishna, and arrive also at an approximate date for him, we are justified in regarding him as a historical figure. The approach that I follow is inspired by the work Sri Krishna Charitra written more than a century ago by the great Bengali author Bankima Chandra Chatterji, supplemented by archaeological and other research that has come to light up to our own time. The topics presented in these articles are discussed in greater detail in my book, Search for the Historical Krishna. According to Indian sources, Krishna was a Vedic figure. He was a younger contemporary of Krishna-Dvaipayana – or ‘Krishna of the Island’ – better known as Veda Vyasa – who by tradition was responsible for the organization of Vedic hymns into their four fold division, the form in which we know them today. He is also by tradition the author of the earliest version of the Mahabharata. It is worth noting that the names of some of the characters of the period are found in the literature of the period and also on some Harappan seals that Jha and I have deciphered. For example, words like Paila (Vyasa’s pupil), Akrura (Krishna’s friend), Vrishni (Krishna’s clan), Yadu (Krishna’s ancestor), Sritirtha (old name for Dwaraka) are found on seals, some of which may go back five thousand years. The greatest barrier to a rational study of ancient Indian history continues to be a nineteenth century colonial fiction known as the Aryan invasion of India. When the ruins of Harappa and Mohenjo-Daro were discovered about 70 years ago, this was followed by a new piece of fiction known as the Aryan-Dravidian wars. Science has now fully discredited both. We now know that the Harappan Civilization came at the end of the Vedic Age. I will not go into their details here, but only mention that in these articles I totally ignore both the Aryan invasion and the idea of the Harappan Civilization as Dravidian, unrelated to Vedic. (See my book The Politics of History, Chapter 1. For a more detailed exposition.) Panini, the great grammarian mentions several Mahabharata characters including Vasudeva (Krishna), Arjuna, Nakula, Kunti and others. We find the names of Mahabharata characters in Vedic literature – Vicitravirya in Kathaka Samhita; Sikhandin Yajnasena in Kaushitaki Brahmana; Janamejaya the grandson of Abhimanyu in Aitareya Brahmana; and Pariksita in Shatapatha Brahmana. And the list is far from exhaustive. Among Buddhist works Kunala Jataka mentions Krishnaa (i.e., Draupadi) in addition to Bhimasena, Arjuna, Nakula, Sahadeva and Yudhittila (Pali for Yudhisthira). Dhananjaya of the Kuru race (Arjuna) and Draupadi Svayamvara are referred to in Dhumakari Jataka. The same work refers also to Yudhisthira as an ancestor of the Kurus of Indapattana (i.e., Indraprastha) and also to Vidurapandita. In addition to these Mahabharata characters, Krishna himself is mentioned in Buddhist works such as Sutrapitaka and Lalitavistara. These works are often hostile to Krishna and his teachings, but the very fact they found it necessary to try to discredit him (and his teachings) shows that he was accepted as a historical figure even by them. They did not try to deny his historical existence. Krishna Devaki-putra is of course Krishna of the Mahabharata. It is worth noting that Krishna studied the Vedas under Ghora of the Angirasa clan, who seems to have inspired Krishna to develop ideas that later went into the Bhagavadgita. The Gita is essentially a summary of the Upanishads combined with the rationalism of the Sankhya philosophy. No less remarkable is the fact that there is a reference to this episode – of Ghora providing the seed of the Gita – on one of the Harappan seals. The message is ‘ghorah datah dvayuh varcah’ – meaning ‘Two essences given by Ghora’, the two essences being the Upanishads (Vedanta) and Sankhya. So in the third millennium BC, Ghora was recognized as the inspirer of this synthesis of Vedanta and Sankhya affected by Krishna in the Bhagavadgita. The important thing to note is that unlike the Harivamsha or the Bhagavata, these works – the Upanishads, the Jatakas, the Sutras or the Brahmanas – are not part of the historical tradition and had therefore no reason to use these names except familiarity. With such profuse references to Krishna and other Mahabharata characters in so many unrelated works of diverse kinds, written in different periods, there cannot be the slightest doubt that they refer to historical characters in a historical era. What remains now is to fix an approximate date for Krishna or the Mahabharata War. Traditional scholars have always held that Kali-yuga – the Age of Kali – began in 3102 BC. Whether this refers to the date of the eighteen-day Mahabharata War or of the death of Krishna is unclear and also I feel unimportant at this time. This results in a discrepancy of about 35 years between the two, which is small in comparison with the very great age of the events we are speaking about. Several astronomers and astrologers of great eminence have attempted to arrive at the date based on astronomical references found in the epics. Professor K. Srinivasaraghavan, perhaps the foremost authority on the topic, has even determined November 22, 3067 BC as the day on which the Mahabharata War took place, but this assumes that ancient astronomical observations are exact which I chose to avoid. I am not suggesting they are wrong, only that I prefer to be conservative. Some scholars reject such an early date as c. 3100 on the ground that the Aryans came to India only in 1500 BC, and Krishna and the Mahabharata War must therefore be later. As noted the Aryan invasion theory has been discredited by science. Also, our decipherment of Harappan and pre-Harappan scripts has taken the Vedas to long before 3500 BC. So these objections can be dismissed. The one arguable issue is the discovery of an ancient submerged city at the island of Dwaraka by the renowned archaeologist S.R. Rao. Rao, who identifies it with Krishna’s Dwaraka dates it to about 1500 BC. But his identification rests on insufficient grounds based on ambiguous literary interpretations. In any event, the historical references in the deciphered Harappan seals, some of which are over a thousand years older than 1500 BC make it impossible that the site found by Rao is Krishna’s Dwaraka. We can next look at Krishna’s date, from two different directions. Since Ashvalayana mentions the Mahabharata and its authors Jaimini and Vaisampayana as ancient, at least a century must have elapsed between the War and his time. He records that in his time plants sprouted after the beginning of monsoon rains in the Hindu month of Bhadrapada. This now takes place in Jyestha or Ashadha. This goes to show that the monsoon in his time used to start in the month of Sravana instead of Jyestha as it does today – a difference of about seventy days. This is due to a well-known astronomical phenomenon called the ‘precession of the equinoxes’. Seasons fall back relative to the fixed stars (and the Hindu calendar which is based on the fixed stars) by about one day every 72 years. What this means is that the beginning of monsoon noted by Ashvalayana must have been taking place close to 5000 years ago or about 3000 BC. Further, Ashvalayana pays homage to his teacher Kahola Kaushitaki who was the sage of the Kaushitaki Brahmana. It mentions several Mahabharata characters. It also mentions that the winter solstice – as the first day of winter is called – took place on the day on which we now celebrate the Maha-Shivaratri festival. The winter solstice now falls on December 21, and the Maha-Shivaratri comes around March 1. This is due to the precession of the equinoxes. This again means that from the time of Kahola Kausitaki, the seasons have moved by about 70 days. So, 70 times 72 or about 5000 years must have passed. This also supports a date of about 3100 BC for the Mahabharata War. Indian Heracles (Krishna) is recorded by the Greeks as having lived 138 generations before the time of Alexander and Sandracottos which we may take to be c. 330 BC. Taking 20 years per generation, which is known to be a good average when ancient Indian dynasties are involved, we are led to the computation 2760 + 330 = 3090 BC which is remarkably close to the Kali date of 3102 BC. So a reckoning based on ancient Greek records takes us again to the traditional date of c. 3100 BC. In summary, we may safely conclude that technical and literary evidence from several independent sources point to the traditional Kali date of 3102 BC as being close to the actual date of the Mahabharata War. We have therefore overwhelming evidence showing that Krishna was a historical figure who must have lived within a century on either side of that date, i.e., in the 3200-3000 BC period. Recently, objects found from supposed dwaraka, immersed in Arabian sea off the coast of Gujarat, are found to be 9000 to 32000 years old. 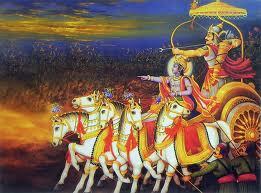 MahaBharath described a war between Sree Krishna and Salva, in a space craft. Sree Krishna destroyed the space craft and later Dwaraka was immersed in the sea, as per MahaBharat. How do they fit in the 5100 years old dating, in the above article? Please forgive me if my doubts are foolish. However, I am eager to know an explanation. I’m going to pass your queries onto the author of the article, as he’s best placed to provide proper answers. However – can you just confirm which section (parva) of the Mahabharata described the war between Krishna and Salva?